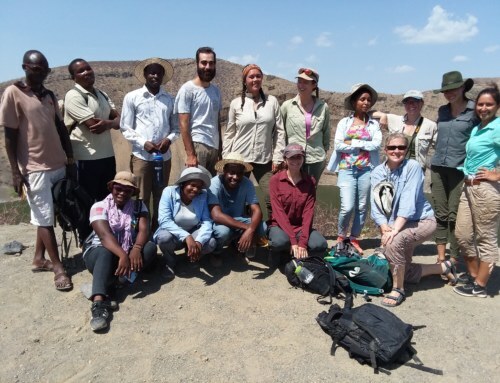 Last week, students took a tour of the Turkana Basin Institute for the opportunity to see what resources TBI uses, understand what makes the campus so unique, and discover what materials are available to be used in their projects. 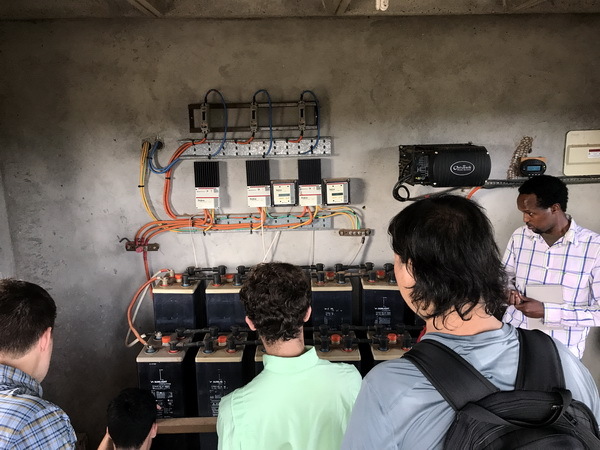 The first stop was the energy systems of the campus. TBI is a completely off-the-grid facility, powered almost entirely by solar energy. 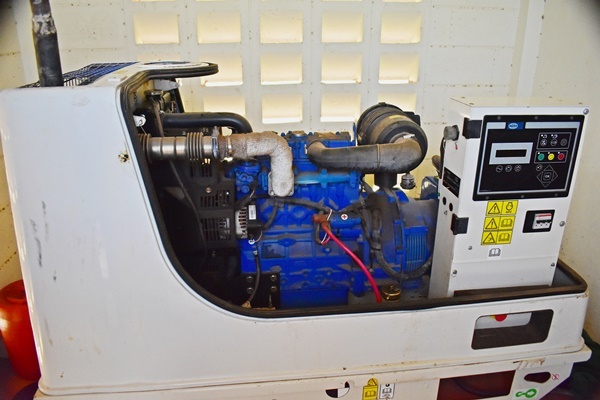 Two generators and a wind turbine act to supplement what is not covered by solar power. 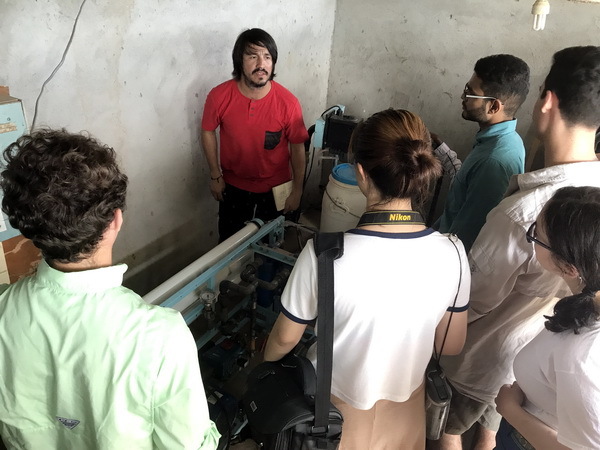 The group was also introduced to the reverse- osmosis machine that filters water collected in a reservoir on-site. At the entrance of the circuit, water goes through an initial filter that takes out sediments. Chlorine is then mixed into the water to kill viruses and microorganisms that may have grown in the liquid. Finally, the filtered water goes through a set of three membranes which take out fluoride and materials left over from the other processes. The result: drinkable water which we use every day. 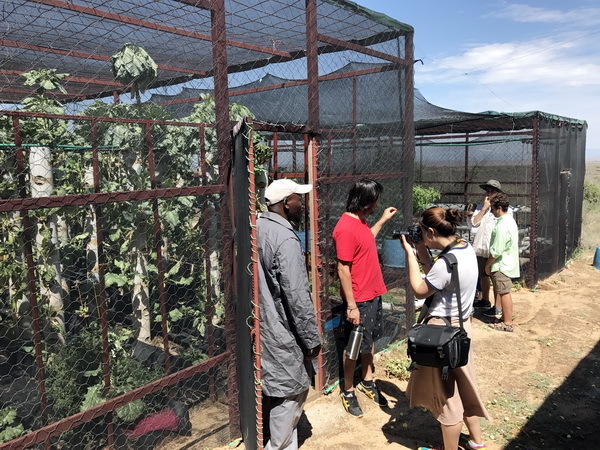 The team also visited a hydroponic system used to grow vegetables at the facility. Hydroponics is the method of growing plants in water-based, nutrient rich solution without the use of soil. Instead, a medium such as gravel is used to support the root system. Through this system, TBI is able to provide the staff and guests fresh vegetables right off of campus grounds. 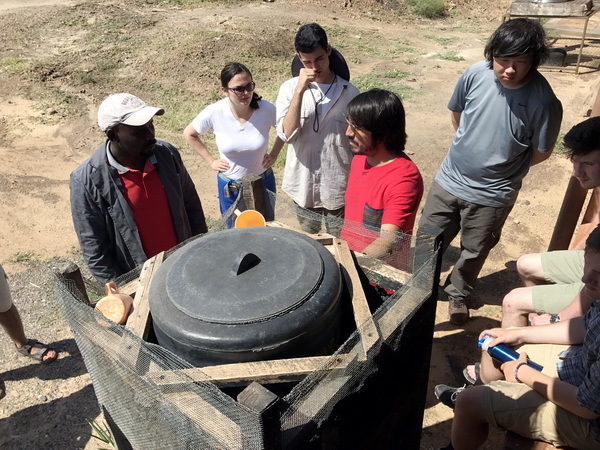 Another incredible innovation that TBI implements is a charcoal insulated reservoir system. 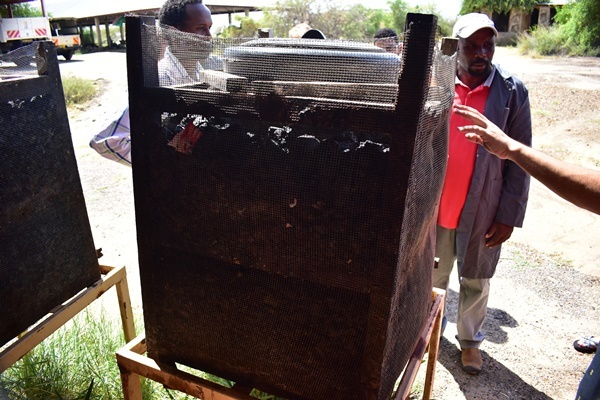 Here a water jug is used to store water and is enclosed with charcoal in mesh casing. Daily, water is poured over the jug. This water evaporates and releases heat, thereby, cooling the jug and its contents. 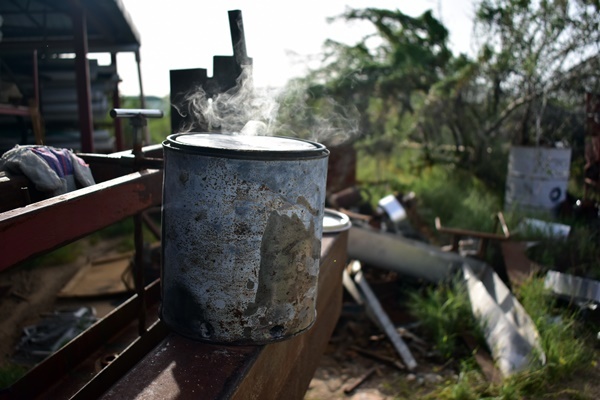 The charcoal acts as an insulator and stops outside heat from transferring to the jug after water is evaporated. This keeps water cool over time. Next, the group moved to the concrete production processing center. The campus mixes its own concrete and puts it through a pressing machine to mold it. From there, the concrete dries for 7 days until it is ready to be used. 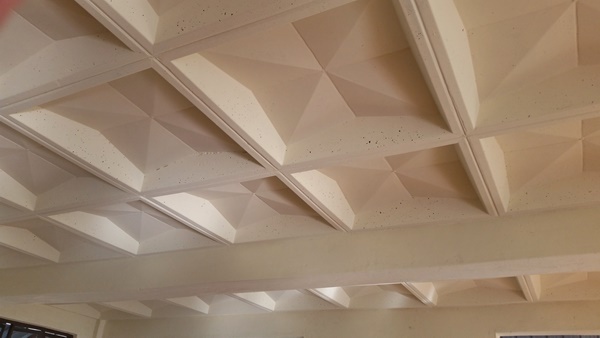 There are even specific shapes available for different uses such as ceiling molds found in the dining area. The Global Innovation team worked hard but fell just short of the win in their first soccer game against the staff. 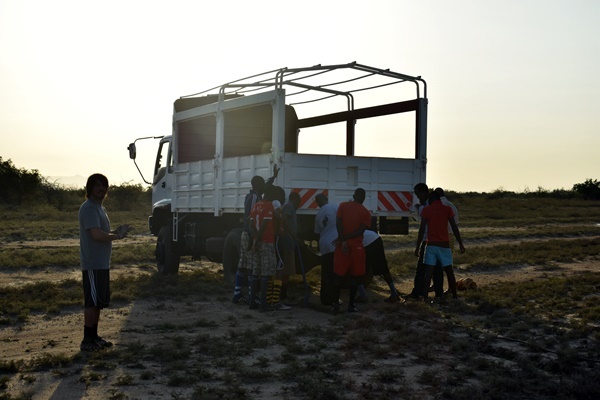 On the drive to their redemption grudge match, the truck shook suddenly and the front of the vehicle sank about a foot downwards. 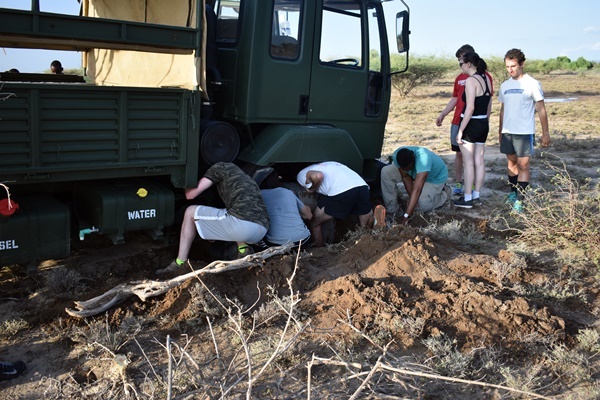 As everyone got out of the truck, they were shocked to see the half of the front tires drowned in mud. The 8-hr rainfall from earlier in the week had saturated the soil and created a trap for the behemoth vehicle. 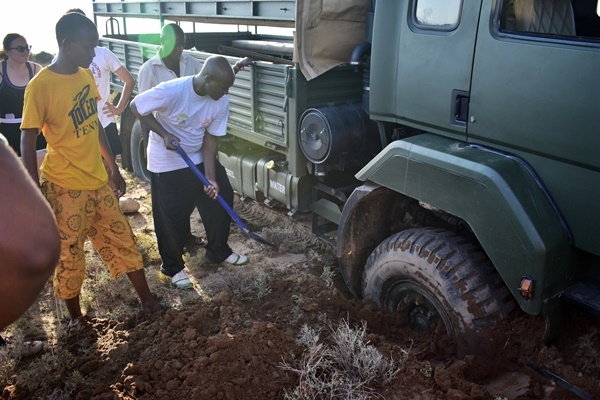 With quick thinking, Rodrigo grabbed a large rock and sat it down behind the wheel to create a foundation that the truck could drive on once in reverse. 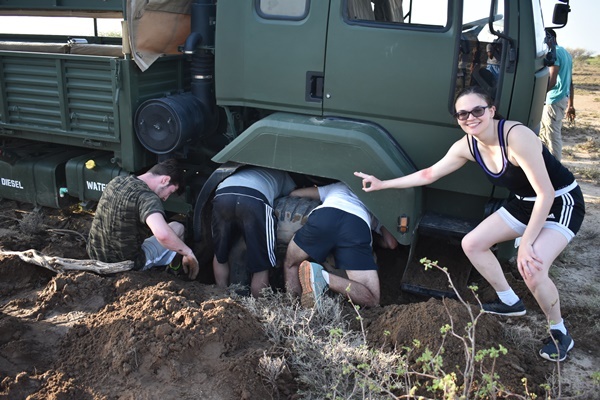 The staff had the same idea- they grabbed thorny bushes and loose branches from within the area and platformed them behind the wheel. Students followed suit. Eventually, another TBI truck came with supplies to assist and pulled the big truck out of the muck. 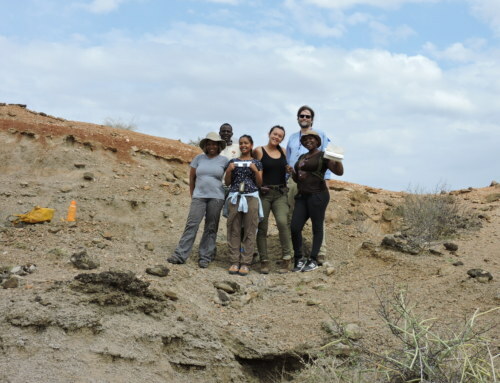 The Global Innovation team had great and productive site visits this week. 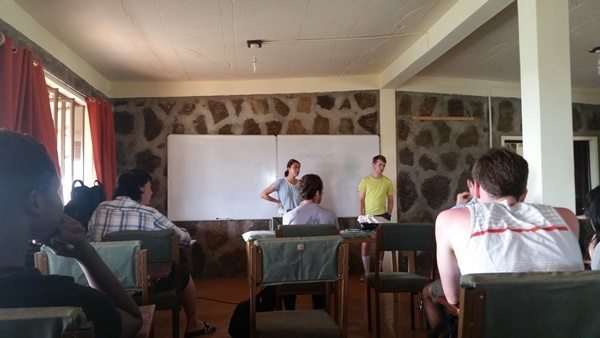 The group had a large meeting where all of the potential projects were evaluated and chosen. 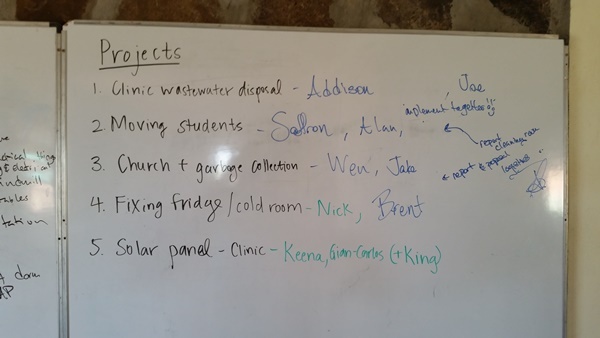 A full board of ideas was set up but only five made it to the “project stage.” The five projects entail a waste water distribution system for the clinic, relocation of students in the local school, a theoretical proposal of a freezer system in the clinic, garbage clean up, and assessment/repair of the photovoltaic systems at both the school and the clinic. Each of these projects is based on a theoretical or practical solution that can be implemented within the clinic or school to improve existing conditions in these very critical areas. 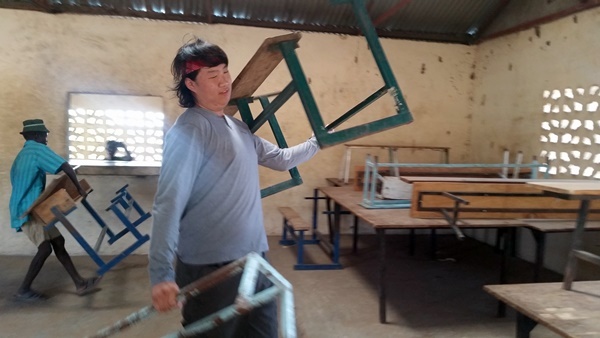 Wen and Jake are leading the charge against waste in the Ileret community. Currently, there is no central location or method of handling trash within the town. Therefore, most of it ends up in the environment and in living spaces of the community. 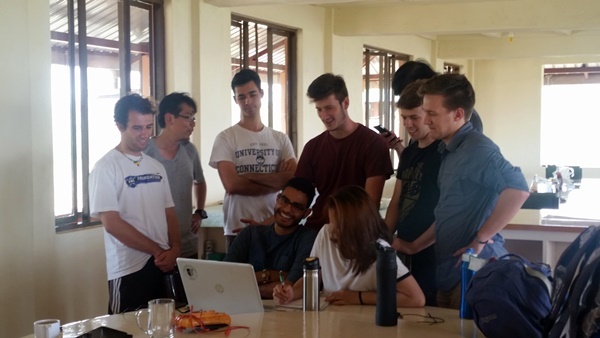 The team wanted to connect to the community and create a program where trash and plastic could be collected and dealt with properly. The two eager members met with Mutuku, the TBI Camp manager, and discussed their idea. Mutuku was excited to hear it and had thought of a similar initiative that he wanted to implement. 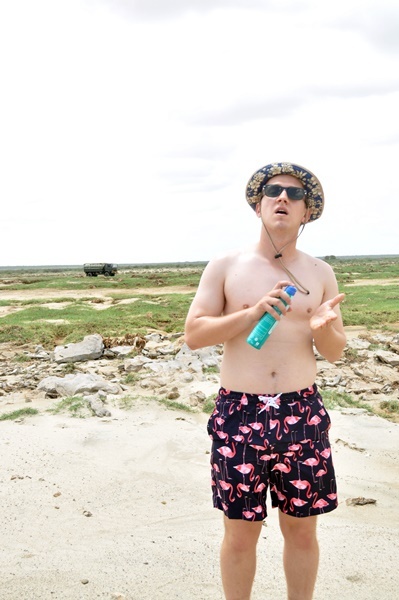 He connected them with Koriye, a young man of the village who wants to make a difference in his community. 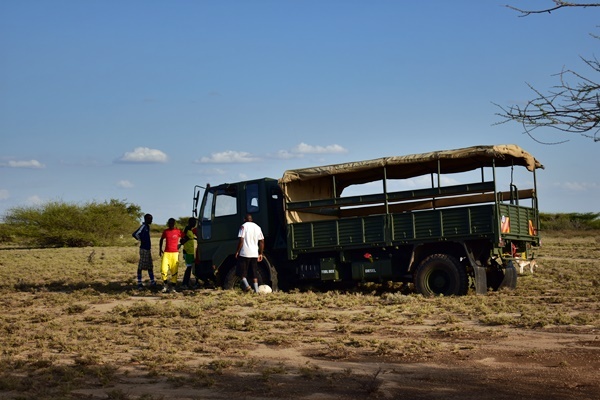 Koriye is acting as a liaison for the team to communicate and connect the project with the community. 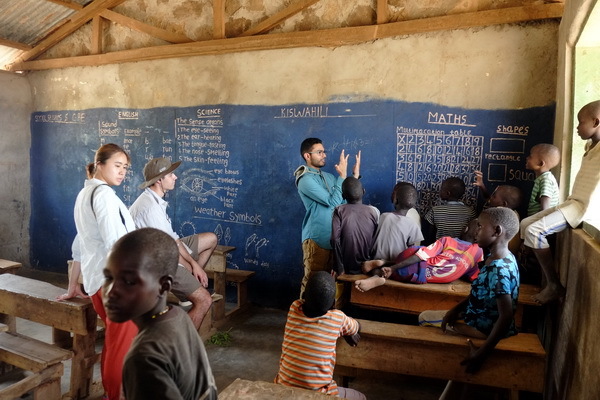 This project has quite a few implications- it creates a stronger connection between the field school and the community, provides the space for an initiative that helps elevate the environment of Ileret town and involves the very people within it. Further, this project creates headway for two long term initiatives in the future. 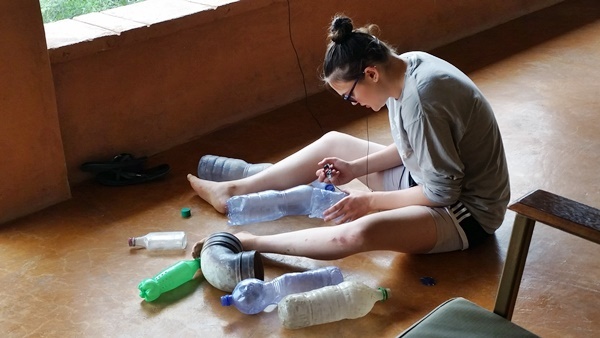 Saffron is creating a long-term project to repurpose plastic and other materials to create musical instruments for the community. Wen has started a long-term project with potential to make a large impact on the community in Ileret. 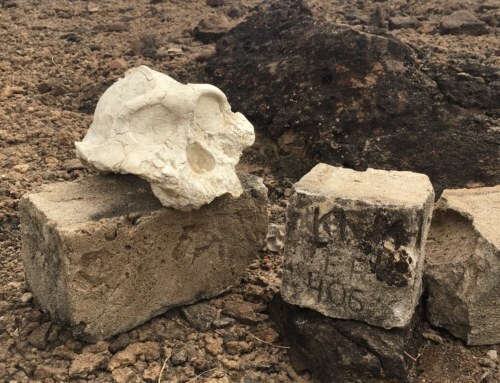 From research on filtering fluoride in water, she found that bone charcoal, a product of burning bones at high temperature, acts as an incredible filter for fluoride. 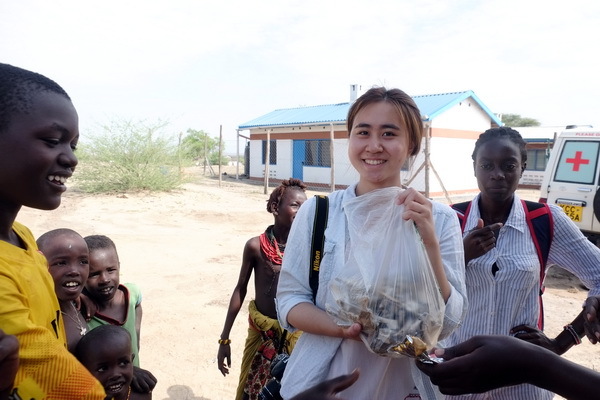 With the help of the local children, students collected bones for the project which are plentiful in the area surrounding the town. 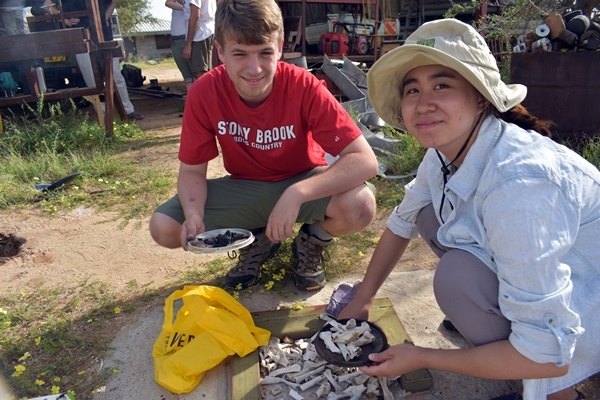 When they returned, Wen and Jake, with the help of our resident director, Deming conducted their first experiment of creating bone charcoal. Fluoride can have incredible consequences on the body if consumed in abundance. In Ileret, many of the children have brown stains in their teeth from consumption of the available water over time. This water does damage to the children’s bones as well and can make them ill, which can lead to larger health problems or worse. 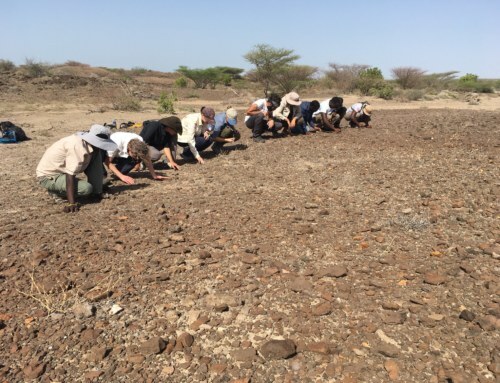 If this long-term project is successful, the community will have a sustainable way of filtering out fluoride from water using abundant materials improving many lives. Higher quality of water is a high need in all corners of the world. This solution could also be replicated in international communities where water treatment is unavailable or scarce in the future. A hot pot of bone charcoal being served up! The head nurse at the clinic, Beatrice, also mentioned to the group that some of the wastewater systems need to be updated. 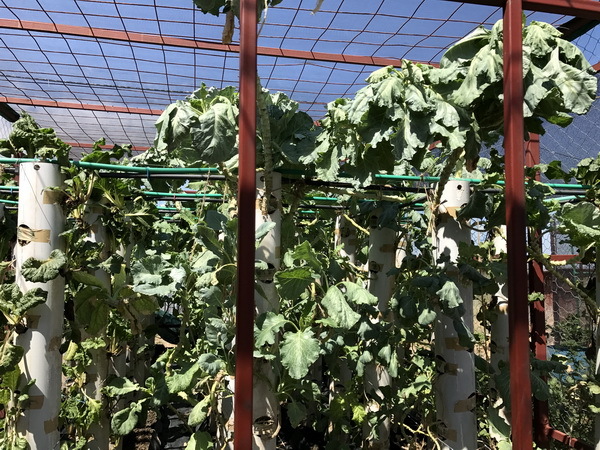 When Joe and Addison, the leaders of the project first heard this, they believed that water piped out of the clinic would need to be irrigated further away from the buildings and distributed evenly outside. Upon further inspection, they found their initial assumption to be wrong: the water facilities currently have no piping systems. This means water isn’t getting outside of the buildings and is accumulating causing erosion inside one of the buildings. There are three sinks and a shower that have to be completely updated throughout the clinic. 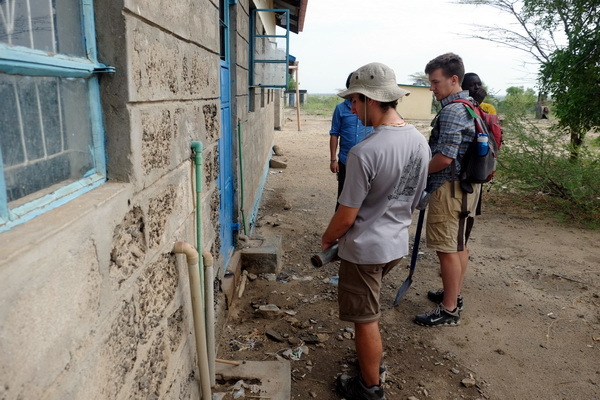 Although lack of materials will not allow the team to complete all three facets, Joe and Addison want to make sure the maternity clinic’s waste water system is updated- a facility that must be kept sanitary to function properly. 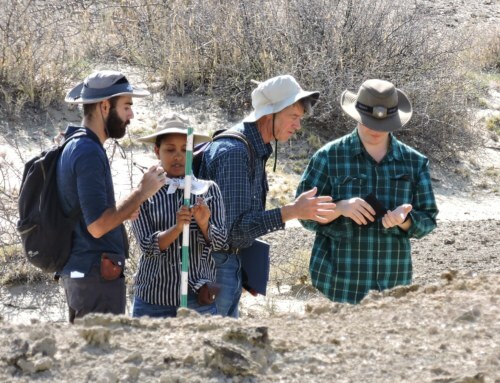 After a lecture provided by Professor Rodrigo Pena-Lang on waste water and waste water treatment, the students took their newfound knowledge and hit the drawing board. First, they plan to replace the piping of the maternity clinic’s main sink to irrigate water outside and away from the building. 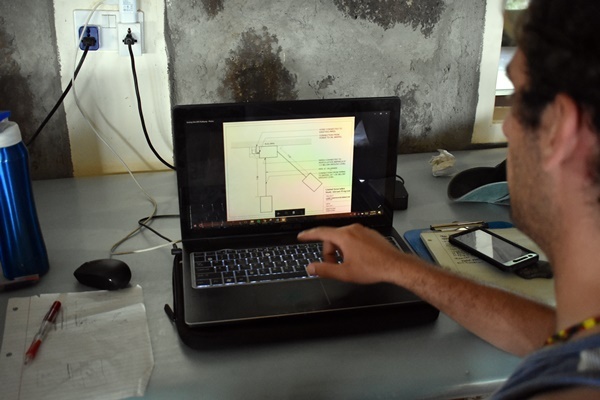 They also aspire to provide new irrigation for the shower within the building that currently uses a hole in the wall as its main source of irrigating water outwards. Without these in place more damage will be done to the building and contaminations could occur within the maternity clinic- a dangerous consequence to staff as well as patients. 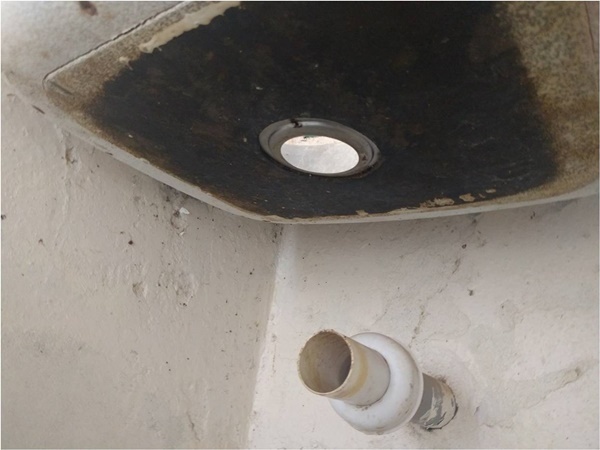 These solutions will put a stop to water that has caused erosion in the building as well as provide cleaner ways to dispose of bio-liquids or mass that goes through the sinks and showers. One major problem for the clinic is proper storage for vaccines. 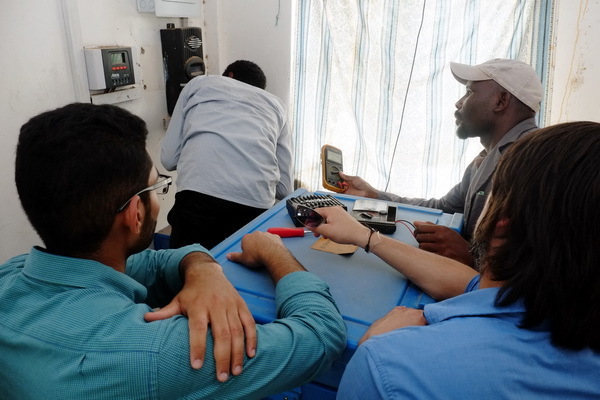 With their solar panel system not functional, the clinic’s electric refrigeration system is not operating. In its stead, they are using a gas powered refrigeration system that only holds half their stock of vaccines and medicines. 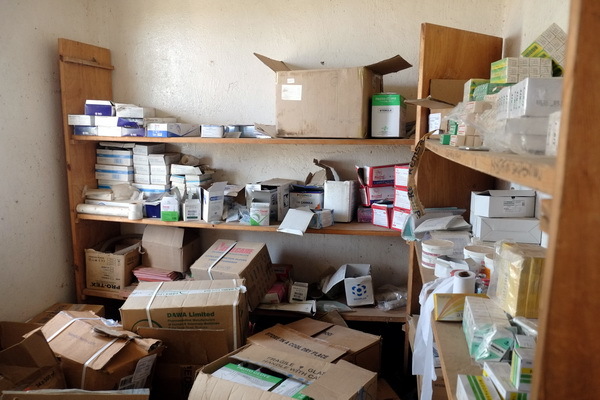 The rest of the medicines are being held on shelves in an open room where they are exposed to adverse temperatures. If medicines are not kept in low temperatures, the lifetime of their use and ability to prevent or stop sickness decreases. Brent and Nick are spear-heading the vaccine freezer storage project. 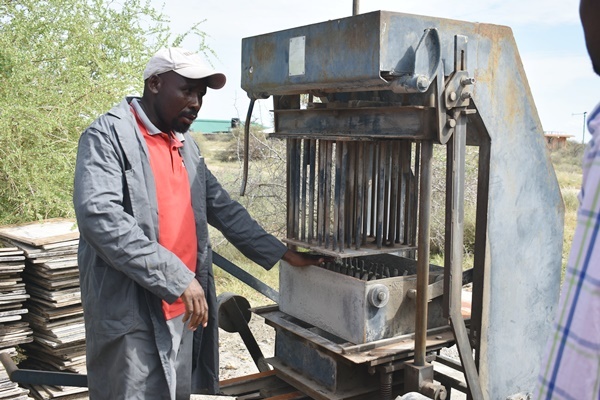 The team decided to base their project off of the charcoal insulation system found at the Turkana Basin Institute. They will use a similar system where water will be evaporated over a sealed enclosure to decrease the content’s temperature. 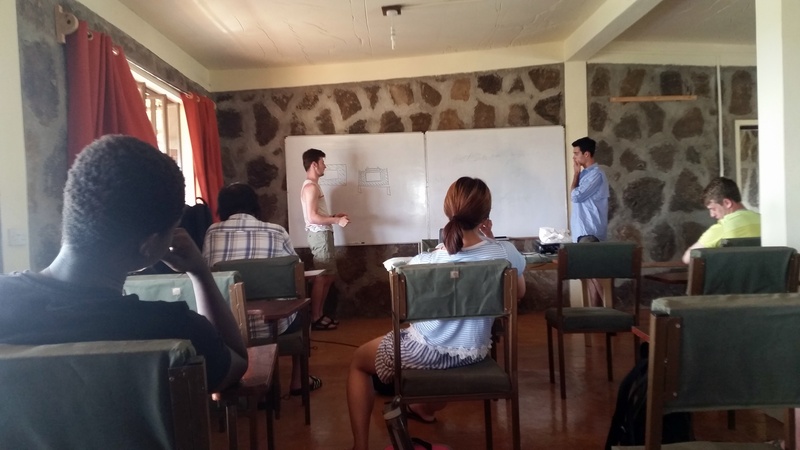 The challenge presented to the students is to meet Beatrice’s standards; the vaccines need to be kept at a temperature of 2-8 ℃ or 35.6℉ – 46.4℉. The team plans to conduct an analysis on the TBI system to create a design of an alternative storage unit that can be used in the future. They chose this design for the project because it offers a sustainable solution that can last for an extended period of time with minimal materials. If their design is made properly, it could have many implications on more than just the Ileret clinic. There are many hospitals and other facilities in need of a freezer unit that does not require a large amount of materials. 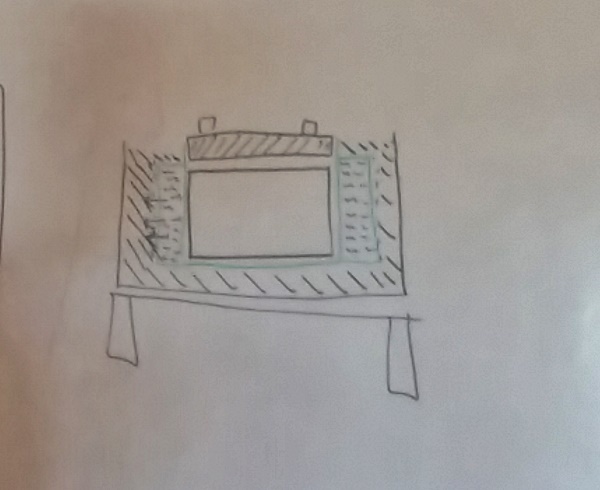 Saffron and Alan are taking on the school’s infrastructure problem. Because part of the building’s structure is breaking down, the school would have to be rebuilt entirely for it to be usable as a classroom. Being that the team does not have the ability to build a brand new building, they have to come up with an alternative solution that will use the resources the school already has. Their plan is to move students out of the three hazardous classrooms and move them into the dining hall on campus and the school dormitory, (both buildings currently abandoned due to lack of resources). To make it an effective space for teaching, old tables in the dining room will be repurposed as a sound barrier in the dormitory to split the building into two different classrooms. Because there will not be blackboards available in the dormitory and dining hall, teachers will use flipcharts to teach students. 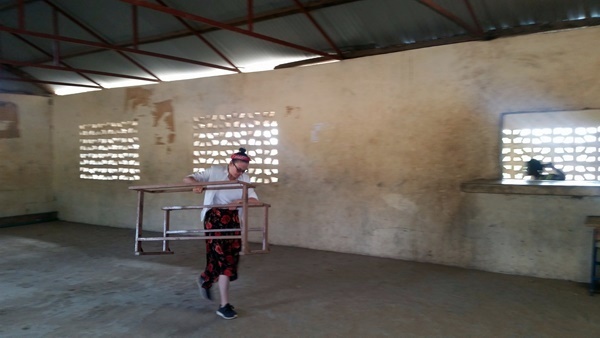 This offers a short-term alternative to students being taught in an unsafe environment and allows the school to make use of facilities that are otherwise being unused. 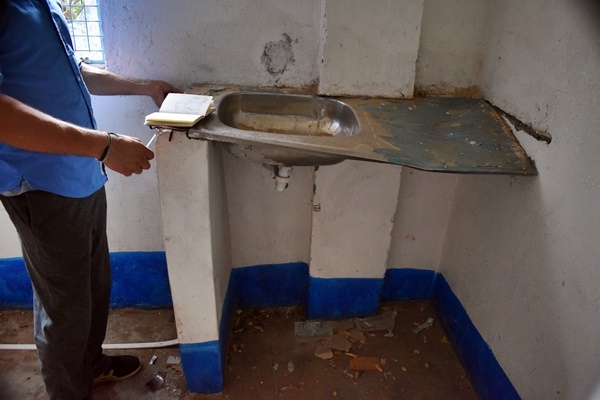 This small adjustment within the school’s arrangement has the potential of saving dozens of lives. 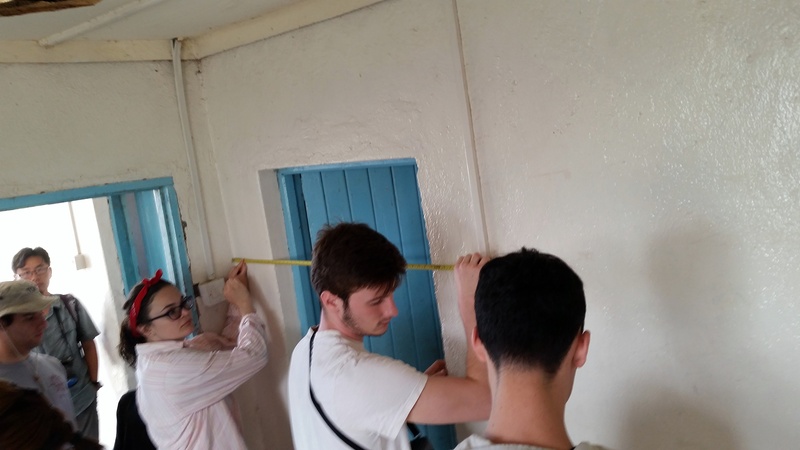 After talking to the head teacher of the school, the group was able to move two classrooms out of the original buildings and into the dining hall. Next, they will have to clean the dormitory and repurpose it as a classroom. 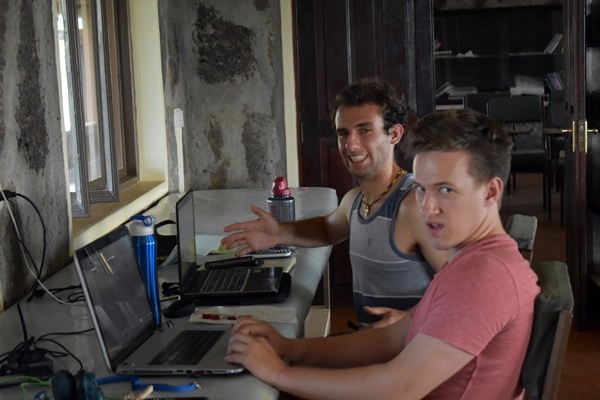 Giancarlos and Keena are the two students in charge of solar panel assessment covering the school and the clinic. 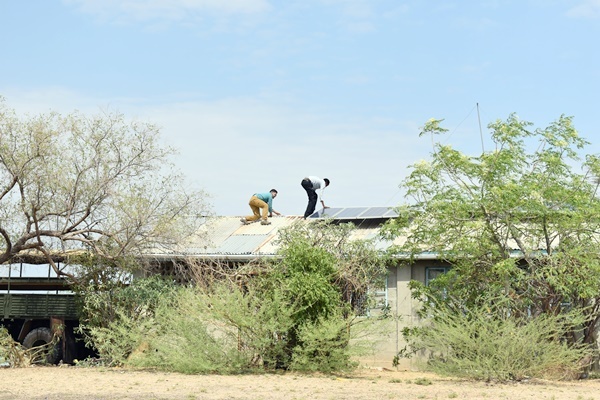 Originally, the Ministry of Energy brought the solar panel systems to the town years ago but hasn’t had any maintenance done on them. 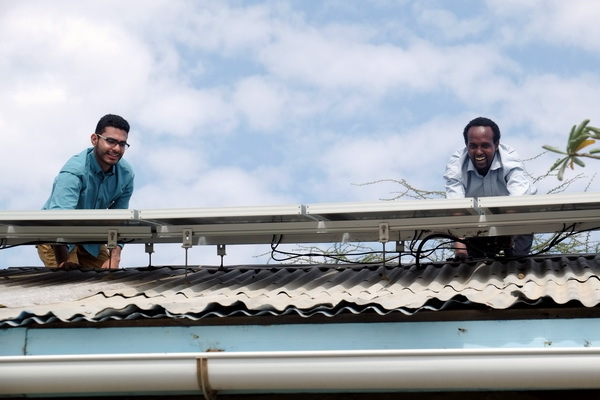 Without maintenance, the solar panel systems have broken down and become unusable. The solar panel systems used in the town are made up of four main components, the solar panels themselves, a device called a regulator, an inverter, and a battery. 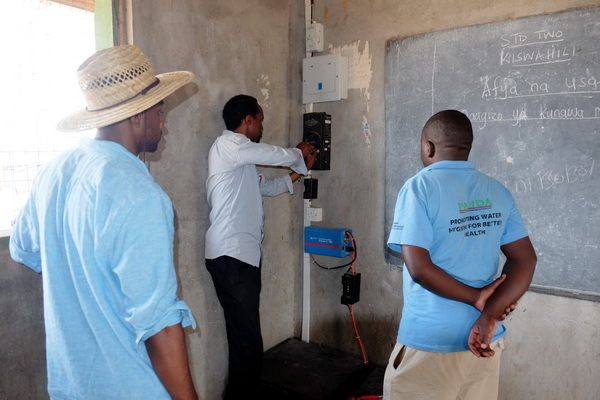 In the school, the main system in the classroom has a dysfunctional inverter which disables use from specific devices, in this case, the lights in the classroom. At the clinic, the main building has a dysfunctional regulator and blown batteries. 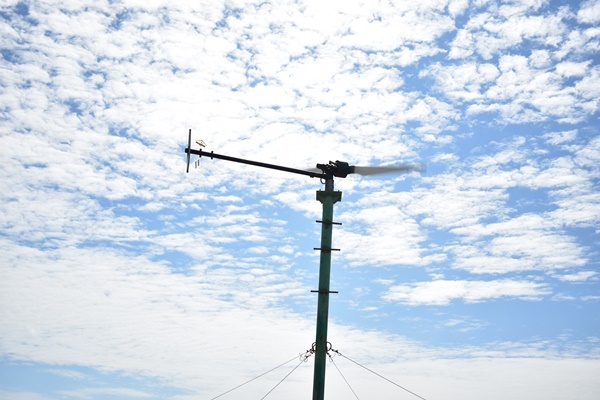 The regulator is used to control power provided from the solar panels. The team believes that because the regulator is broken, the batteries attached to the system have not had energy regulated towards them. This coupled with the high heat of the region has caused them to be overcharged and burst, rendering them useless. To solve most of the solar system problems, new parts would have to be obtained to replace the malfunctioning devices. 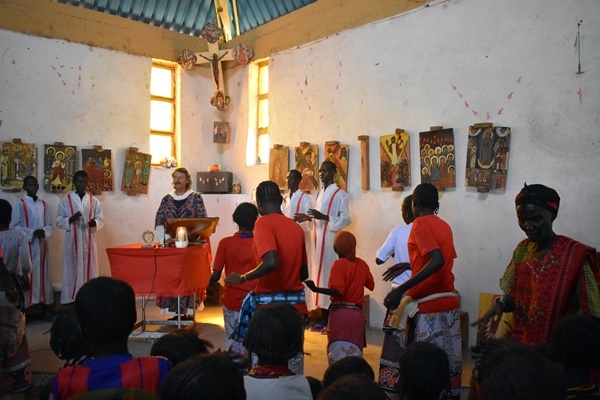 Being that Ileret is in a remote area, that option is not available for the team. However, an alternative is to salvage working parts from one system and install them in another. Giancarlos and Keena have decided to ask the head teacher at the school to allow them to take the regulator from the unused system in the classroom and reinstall it in the clinic. 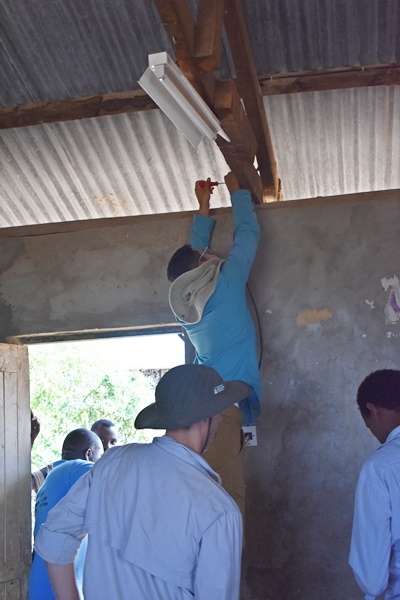 This would allow the clinic to use the lights in their main facilities, a much needed function. They are going to propose the solution later this week. 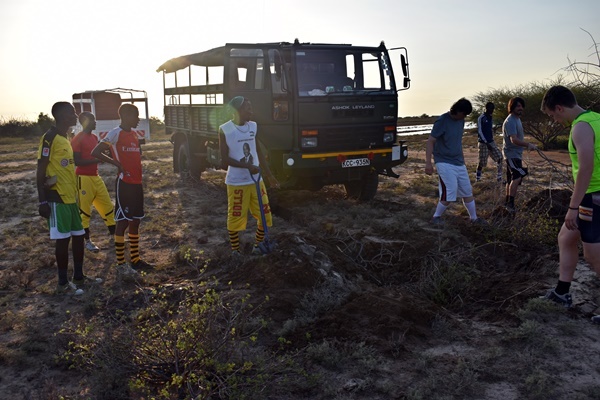 One exceptional thing that the teams have done is create an opening for the community to be involved in the projects. 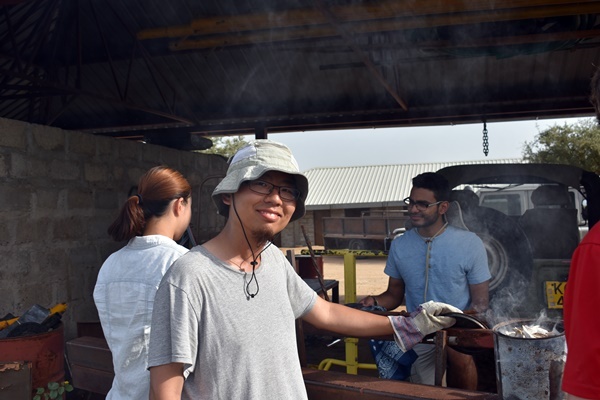 As the groups have seen in Ileret, some organizations have the best intentions in making a difference, but often times forget that in order for a project or solution to work, it must involve the very people it is supposed to work for. Without this aspect, many pieces of information that are crucial to the implementation of the project can be missed and/or miscommunicated resulting in worse conditions than were originally in place. 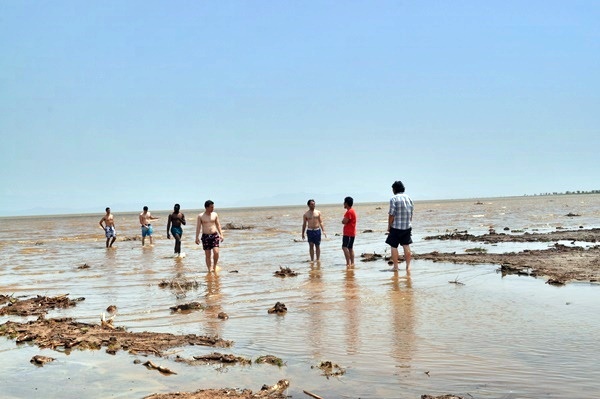 These students are learning from their predecessors’ mistakes to make a sustainable impact on the people of Ileret. 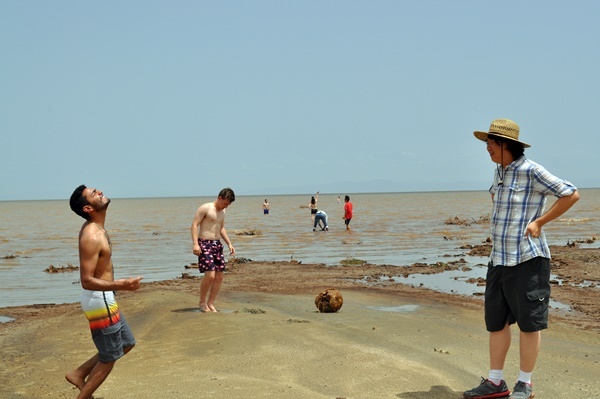 After an intense week, the students took a moment to lay back and enjoy Lake Turkana.